The kind of diet that we are going to have on Thanksgiving Day…. If you ate all of those delicacies and desserts every day, it would kill you! But we do have a spiritual diet that God offers us that will keep the system running properly, provide health and vitality to all parts of your life, and help you to mature as a Christian and be able to arrive at the CONTENTMENT that God desires for you. Paul tells us to Think about what is True, Noble, Right, Pure, Lovely, Admirable, Excellent and Praiseworthy. Look at the headlines from this morning’s paper or news program. The media knows that it can capture our attention by publishing alarming things. Bad news sells more papers than good news. It triggers a reaction within us that gets us stirred up. Paul is not saying, nor am I, that we ignore bad news. Dwelling on the bad news that you can’t do anything about does not lead to the kind of contentment that God desires for you. It does not lead to the kind of life that expresses great gratitude and thanksgiving. If we only focus on the dark and tragic things that are going on, we will become depressed and defeated. We need to turn our attention to the good things that God is doing, has done, and has promised to do for us. To a degree, you become a product of your environment. What do you have on your walls in your house or in your office? If you come into my office, you’ll see a lot of pictures and mementos. You will see portraits of family, reminders of successes and awards, diplomas, some excellent Christian artwork. I have these in my office to remind me about the most important things in life. I surround myself with them because when I think about each of these, I am reminded about what is substantial in life, what really matters. Remember this principle: Good in, Good out. Do you make time to dwell on the good things of God in your day? The more anxious you are, the MORE important it is that you spend some time dwelling on things that are Excellent and Praiseworthy. The news is going to fill your head with enough Bad News to get you down. You need to make sure that you are consuming enough Good News to pick you up. This isn’t some kind of mystical positivity lesson. This is about getting our minds off of the garbage that originates down here, and taking stock of the treasure we have from heaven. Another way that this word we’ve translated “To Think On” is used in the New Testament is “To Account For.” When you stop what you’re doing, when you cease worrying, and account for and take stock of all the Excellent and Praiseworthy things that are present in your life, it will pull you up out of whatever pit you might find yourself in. When you fill your mind, your heart and your imagination with the Excellent and Praiseworthy things God has placed in your life, you’ll find greater contentment. You’ll find the kind of contentment that leads to greater satisfaction and gratitude toward God. This entry was posted in Musings on November 4, 2018 by pastorburden. In order to arrive at the contentment that God desires for us, we have to go through our lives and clean out the garbage. Worries get to the point to where they start to stink. We need to go through each part of our lives and see what lingering worries have us down. We need to see what can be swept out with the trash and what can be given to God in trust and thanksgiving. It’s important here that Paul says to offer our worries to God with Thanksgiving. It’s OK to thank God for what he is going to do. The worry we suffer under is usually about things that are not in our control. We need to learn to give even that to God. We give him the burdens of our heart in such a way that it increases our trust in him; in such a way that it grows our faith in him; in such a way that we can move on without that weight upon our heart. Jesus reminds us about how senseless worry is. He tells us to look around and consider the lilies of the field and the birds in the air. God makes the lilies beautiful and provides food to the birds. He asks us if any of us by worrying can add even a single hour to our life? The secret here, from Jesus’ words, seems to have something to do with the KINGDOM. We get overwhelmed with worry as we continue to look at the main project of our lives as one of advancing and building OUR KINGDOM. We want things to go OUR WAY. We want OUR WILL to be done, certainly in our lives, but even in the lives of others. But that’s often not the case. 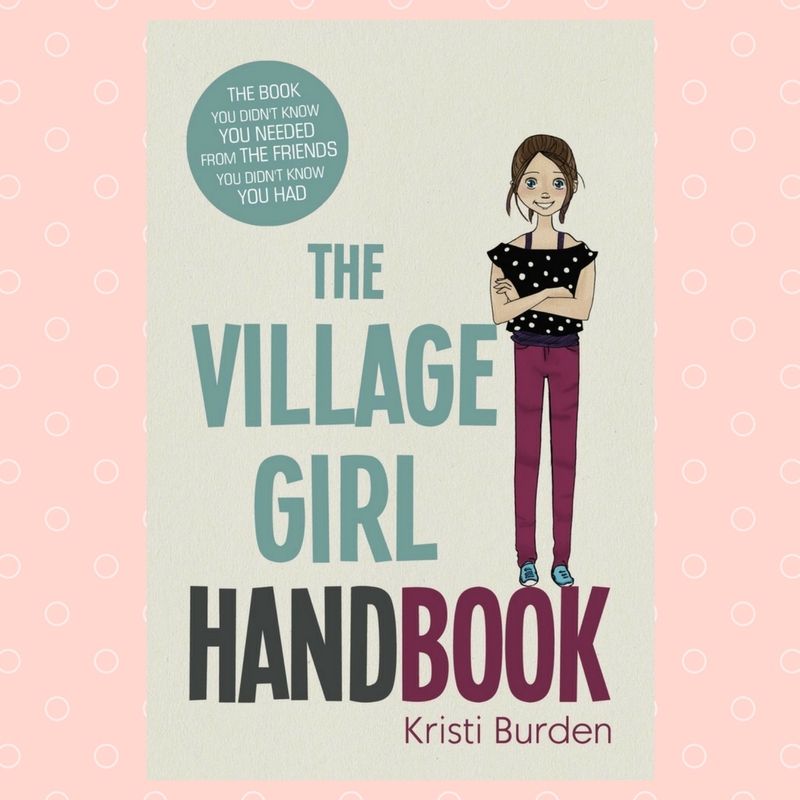 We get worked up over how to control things, and people. Paul had an affliction. He described it as a “Thorn In His Flesh.” We don’t know specifically what it was, but we know it bothered him. We can imagine that it was something painful for him. We are sympathetic with his struggle because it’s part of the common struggles that we all endure. Paul testifies that he prayed over and over again for relief, but God sent no relief. What God did for Paul was even better than taking the Thorn away. God showed Paul that his Grace was Sufficient. God showed Paul that the struggle he was going through was purposeful. Paul was weak, and God was strong. The weaker Paul realized he was, the mightier he realized God was. Paul came to the point of contentment and satisfaction in his work with God when he realized that the success of the work was not up to him. Isn’t that a liberating thought? It’s not up to me. There are so many things that we worry about, worry that wears us out. Paul teaches us to give our worries to God, and with thanksgiving, learn to place our trust in him so as to express gratitude for how he will continue to work all things out according to his good purposes. This entry was posted in Musings on November 2, 2018 by pastorburden. When you are struggling, it’s difficult to finding Joy in the everyday occurances of Life. There are times when we need to tell ourselves to rejoice. We may not feel like rejoicing, but we need to rejoice. That’s what Paul does here. He’s not telling us to rejoice when we feel like it. He’s commanding us to rejoice, whether we feel like it or not. This is really an amazing command given Paul’s circumstances. Paul is composing this letter, with these instructions for contentment and rejoicing and thanksgiving, while he’s in prison! His freedom has been stripped away. He has been cut off from his comforts and his loved ones. His situation is the antithesis to what we would think leads to rejoicing. But rejoicing is exactly what he knows he needs to do. When we make rejoicing a priority, God gets the glory and we get the benefit. Rejoicing elevates our mind and our heart out of our current predicament. How can we make REJOICING a habit? What does that look like for us and what does it do for us? What is an example of REJOICING while in a terrible circumstance look like? Try this: The next time life gets you down, rather than looking around at the mess you are in, look up to God, and tell him Thank You for the first good thing that comes to mind. See if that doesn’t provoke another thought about something good to thank him for. This practice of Rejoicing and Thanking God might not change your situation, but it will change how you are able to overcome the problems you in. November is a time for Thanksgiving. It’s a season for looking back over the previous 10 or so months and taking stock of how good God has been to us. We need to pause and see how God has been with us, how he has comforted us, how he has grown us, and how he has taught us to lean more and more on his grace. I think it would be appropriate to call this time of reflecting a Season of Gratitude. Christians, of all people, ought to be excellent at practicing gratitude. All that we hope for in Christ is made possible, not by our merit, or hard work, or by anything we possess. All that God offers us and all that he has promised us is a product of his GRACE. Because our salvation is a grace thing, it’s only right that we live our lives as a response to God’s graciousness. That response is called GRATITUDE. The key to greater gratitude toward God is greater contentment in living. When I think about a passage that shows us what contentment looks like, I think about the 23rd Psalm. I think about the contentment of those sheep who are led by streams of water, who lay down in green pastures, who follow their shepherd down paths of righteousness. That Psalm isn’t just a description of who God is and what God does. It’s also a description of what we can look forward to as we learn to trust God as our good shepherd. When we follow him, and learn from him, we are going to find ourselves resting in those green pastures, being refreshed by the living waters. And even when there are enemies all around us, we’ll find that our God has prepared a table of blessings before us. God’s sheep are always in need of learning how to be content in God so that they can express greater gratitude to God. There is something about a TRUSTING people that exudes contentment. There is something about the image of the Good Shepherd with his sheep, guarding them and guiding them, that helps us understand the kind of contentment that God desires for us. This entry was posted in Musings on November 1, 2018 by pastorburden. 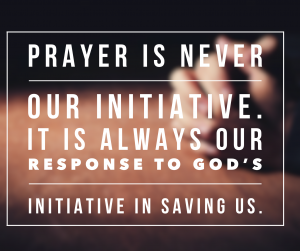 Prayer is never our initiative. It is always our response to God’s initiative in saving us. What God has done for us. I was pondering that thought this morning as I was reading from 2 Corinthians. In this passage I was reminded that God has, through his grace, changed us. The change he has brought us is not a product of our efforts to improve ourselves, but a complete regeneration brought about by the work of Christ. Without the work of God in our lives, regenerating us and restoring us, we are not able to live for him. But since he has come to us, and called us to himself, we are now able to experience the new birth that come by faith in Jesus Christ. What God is doing in the world. What God did for us, he is doing in the world. God is at work all over the world drawing people to himself. All this is from God, who reconciled us to himself through Christ and gave us the ministry of reconciliation: that God was reconciling the world to himself in Christ, not counting men’s sins against them. The world has many problems, but all of the world’s problems are rooted in the rebellion in Genesis 3. When mankind, through the disobedience of Adam and Eve, fell into sin, we all fell hopelessly out of relationship with God. God has been working since the fall of man to restore sinful mankind to himself. The work of Christ reverses the curse we inherit from Adam. What God wants to do through us. God chooses to work through his people. As he saves us, restores us, and redeems us, he also calls us into his kingdom’s service. An ambassador is a lofty position, but it properly denotes the responsibility that has been laid upon us. We represent our Heavenly Father here on earth. Through our witness and our ministry, we make the Good News that Jesus saves known to the world around us. The length God goes to accomplish his work. The Apostle Paul concludes his thinking in this passage with a pearl of great inspiration. He reminds us about the unimaginable length God went to secure our salvation. Jesus, sinless, perfect and divine, took upon himself our sin, and our guilt, and our human depravity as he suffered on the cross. The blood he shed on Calvary washed away our iniquity. We are no longer guilty, we are forgiven. Our forgiveness and our salvation are not a product of our merit or good deeds, but a result of the radical change afforded us by the grace of God. If God was willing to go so far to save us, consider how far we should be willing to go in order to participate in the work God has given us. This entry was posted in Musings on August 8, 2018 by pastorburden. There are a few times each year when our worship service takes on an elevated element of reverence. Any Sunday that we observe the Lord’s Supper is a Sunday of heightened awareness of what Jesus did for us. This coming Sunday we will share the Lord’s Supper during our morning worship service. 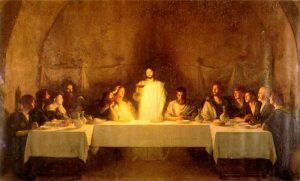 The Lord’s Supper is a reminder that we are connected, as Christians, by our belief in Christ. We believe that Jesus is the Son of God. He lived a sinless life but died a sinner’s death on the cross. In his death he became the atoning sacrifice for our sinfulness. We remember that he was buried in a borrowed tomb and rose victoriously from the grave on the third day. And, we remember that he is coming back, just as he promised. It’s in these beliefs that we find true spiritual unity. Our unity in Christ is what binds us together whenever we worship, but most certainly when we share the Lord’s Supper. When we share the Lord’s Supper, we become active participants in the worship service. As the elements, the bread and the cup, are passed down the pew from one person to the next, we have an opportunity to serve one another. When the bread is passed, the one giving says to the one who is receiving, “This is Christ’s body broken for you.” Similarly, when the cup is passed, each person says to their neighbor, “This is Christ’s blood shed for you.” We are all preachers of the New Covenant when we share the Lord’s Supper. For whenever you eat this bread and drink this cup, you proclaim the Lord’s death until he comes. I’m looking forward to seeing you this Sunday. If you’re not able to be in church with us, consider joining us on our Facebook page www.facebook.com/FirstBaptistChurchNederland at 10:15 AM on Sunday mornings as we broadcast our entire worship service. This entry was posted in Musings on August 3, 2018 by pastorburden. 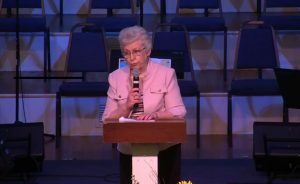 This past Sunday I asked Carolyn Wilkinson to share with our graduating seniors words of wisdom as they enter into a new season of their life. Her message was so important that I wanted to offer it to as broad of an audience as possible. Here is a video of her advice to our graduating senior, as well as the text of her message. Be sure to share this with any graduate in your life. When I was asked to say a few words, I had no idea what to say to you as you begin your life after high school. Then I remembered a Facebook conversation on this very subject. These are some comments from my college classmates—now friends. Never underestimate the value of a college education. You will be with those who will be making changes all over the globe. Don’t take yourself too seriously and realize that homesickness affects everyone. Be grateful for the college experience as it’s happening… and study with others. Don’t be afraid of the faculty. Get to know them and let them know you. (This is much easier with some than others. )They have experiences and expertise that you need not only at school but later in life too. Get involved and get to know other students. Your life-long best friends will come from college days. Lean on each other, support each other and study together. Best advice: Give continuous effort to developing deep relationships with as many students and teachers as you can. Next: be actively involved in local church ministry (and or the Baptist Student Ministry) and be a dependable member of the fellowship; not just in a circle of the students, make church a priority, work hard both on and off campus. But, don’t forget to have fun. Enjoy college, don’t stress out on making straight A’s, get involved with sports, music, drama and making friends for life , and you might even find that person you will spend the rest of your life with, and lastly serve and honor the Lord . Don’t limit your circle of friends to those you are around all the time. Branch out and cross into other groups to get to know a variety of people. Education isn’t just academics. It’s a time to explore possibilities. Don’t limit yourself to your known talents. Try something new. Get involved on and off campus. Enjoy!! Involve yourself in campus life…pour yourself into the lives of those around you and let them pour into you. Don’t drop out. Have Fun. Love Each Other. Have fun and write down the stories (they will be fun to remember years down the road—you may need little reminders then as to what really happened)! Love Jesus and love others with all you are! Don’t be afraid to try something new and don’t be afraid to change your course. It took 4 years to learn I didn’t want to be a teacher. (Actually, I was pretty sure earlier than that, but too stubborn to adjust my course.) I still learned many things and made many friendships that I treasure. So thankful for my college experience! Take a course you don’t need to take for the joy of learning. Complete an internship or applied course. Ask questions, lots of questions. Don’t ever stop asking questions. Read books you are not required to read. 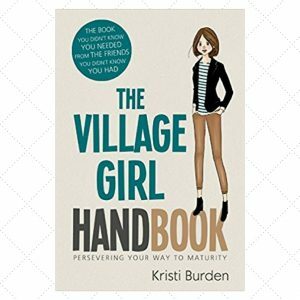 Develop a skill that you didn’t have going into college. Collect memories, this experience will not come again. Make friends for life. Grow in faith. Do not choose a major your freshman year…you will change your mind a few times. FINISH your degree. Have fun! Don’t go back home the first day! It will get better, and you will have the time of your life! Study but take time to meet new friends and don’t give up after just a few weeks. It gets better after 3 or 4 weeks so please don’t give up!! This entry was posted in Musings on June 5, 2018 by pastorburden. Back in high school, through some of my Ag classes, I was part of the Range and Pasture Judging Team. A couple of times each spring we would get on a bus and rendezvous with hundreds of other young agriculturalists from all over central Texas in someone’s pasture. Our task was to grade the land we were observing based upon various criteria such as depth of soil, presence of different types of grasses, and the overall condition of the grazing available to livestock. The hardest part of the Range and Pasture Judging competition, for me anyway, was the identification of grasses. To this day I still struggle to tell one type of grass apart from another. I remember one competition that we went to that was particularly hard. I can’t remember how many grasses we had to identify. It might have been 20. Each grass we had to identify was marked with a small stake with a number. The judges that set up this competition did something to frustrate all but the nerdiest of the grass lovers. They put a little stake beside a few blades of grass that had just begun to emerge from the topsoil. This young grass could not have been even a week old. To make matters worse, they had cleared the ground around this grass from all other vegetation. There was no way to make a guess based on what other grasses were growing around them. When my turn came to observe the little grass I was just as stumped as all the other competitors. It appeared to be growing in a little bunch, so it could have been Little Bluestem. But in my heart it thought the judges were trying to weed out the false Texans by marking an immature batch of the state grass of Texas, Sideoats Grama. Of course it did seem like this little tuft of greenery could have been Buffalo Grass, a grass I still cannot positively identify to save my life. I usually guess Buffalo Grass if I wasn’t sure about a grass in a competition. I tended to write down Buffalo Grass a LOT. It turned out that I was wrong on all of my thinking. These tender little shoots, freshly emerging from the ground, though they looked like the makings of the glorious Little Bluestem, or could have potentially have been the beneficial Sideoats Grama, turned out to be a little weed called Perennial Threeawn. Jesus tells a little story about a field that was sown with good seeds, but before they began to sprout, an enemy came in at night and sowed bad seeds in the same field. Jesus gives us a picture of God’s mercy. The weeds in this story are a type of grass called tares. The roots of the tares grow in such a way that they are intertwined with the roots of the wheat. To pull one of these out of the ground would be to also uproot the other. The tares and the wheat, as they are growing, look very similar. The landowner in the story knew that to send his workers into the field before the harvest to purge the field of the weeds would cause irreparable damage to his precious wheat. The best course of action was to wait until the harvest time. At harvest, the difference between the wheat and the weeds can be easily discerned. Even a worker who didn’t know the difference between Buffalo Grass and a hole-in-the-ground could tell the wheat apart from the tares. When we get frustrated at the evil in this world, remember that God has a plan to deal with evil, in all of its forms. God is not slow in bringing his judgment; God is patient. In his patience he knows the day and the hour of the judgment against evil and the salvation of the righteous. As God brings time to a close, he will do so in such a way that not a single stalk of his wheat is lost. That’s how precious we are to God. Our job, between now and the judgment, is not to identify those who are among the wheat and those who are among the weeds: our job is to love. God calls us to love and pray, even for those who are our enemies. May the mercy we have received translate into mercy that we are able to extend to those around us. This entry was posted in Musings on February 28, 2018 by pastorburden. Jesus presents us with spiritual challenges that stretch us. He commands us to do things that are well beyond our strength. He calls us to do that which our fallen hearts find no joy in doing. Our natural self does not want to love our enemy. We do not have a desire to do good toward those who hate us. We naturally want to return a curse for a curse given. And praying for those who mistreat us is about the last thing that would show up on our prayer list. But these are things that Jesus commanded us to do. When I counsel with children who come to faith in Christ, I always tell them that being baptized, as a sign of our faith and in obedience to Jesus’ command, is one of the easiest steps they will take in their life of being a Christian. As we can see in the passage above, Jesus calls us to do things that are much more difficult than being immersed in water. But why do these difficult things? Our enemies are probably not going to get any nicer to us. Those who hate us are not going to suddenly have a change of heart. The ones who have cursed us will most likely continue to curse us. And there is not a high likelihood that praying for those who have mistreated us will force them to act any better toward us. The answer to the WHY question has nothing to do with changing the hearts of others…it has everything to do with us representing our heavenly Father here on Earth. To be Christian is to follow Christ, in all that he says and does. We show the world that we belong to God when we reflect the goodness of God to those around us. 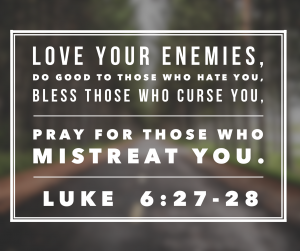 We see Jesus loving those who were his enemies…. So we love our enemies. So we forgive and bless those who have harmed us. While he was still speaking a crowd came up, and the man who was called Judas, one of the Twelve, was leading them. He approached Jesus to kiss him, but Jesus asked him, “Judas, are you betraying the Son of Man with a kiss?” When Jesus’ followers saw what was going to happen, they said, “Lord, should we strike with our swords?” And one of them struck the servant of the high priest, cutting off his right ear. But Jesus answered, “No more of this!” And he touched the man’s ear and healed him. So we seek the spiritual well being of those who have cursed us. So we pray for those who have injured us. As we Love, Forgive, Bless, and Pray, especially for those who have hurt us, who have caused us pain, we show ourselves to be children of our Father in Heaven. This entry was posted in Musings on February 21, 2018 by pastorburden. After astronaut Scott Kelly returned to earth on March 1, 2016 from his record setting stay in space, he was two inches taller than when he blasted off 340 days earlier on March 27, 2015. Scott Kelly, on the right, grew a little taller than his twin brother Mark, while he was orbiting the earth in the International Space Station. The absence of gravity on the International Space Station, orbiting 249 miles above the earth, allowed his spine to expand and increase his height. Now that he’s back on the planet dealing with gravity, he will soon shrink down and match the size of his identical twin, retired astronaut Mark Kelly. This physiological phenomenon is a figurative illustration of what life on earth does to you – it weighs you down. We all feel somewhat stooped over by the weight of guilt, loss, disappointments, regrets, and every other challenge common to humanity. This entry was posted in Musings on February 20, 2018 by pastorburden.